The EOI program explores globally to discover and characterize new hydrothermal vent sites and undersea ecosystems to assess their potential resources and their chemical impact on the ocean environment. 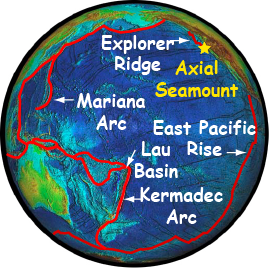 The Mariana Volcanic Arc extends from 13°N to 23°N in the western Pacific Ocean, north of Guam. The Mariana region contains 9 volcanic islands and more than 60 submarine volcanoes, of which at least 20 are hydrothermally active. The summits of these submarine volcanoes range from 50 m to more than 1800 m below sea level. This one of the most active volcanic regions on Earth. Ocean crust that was born along the mid-ocean ridges millions of years ago in the eastern Pacific is “recycled” back into the Earth’s mantle as the ocean floor descends into the Mariana Trench. Visit the Mariana Theme page. 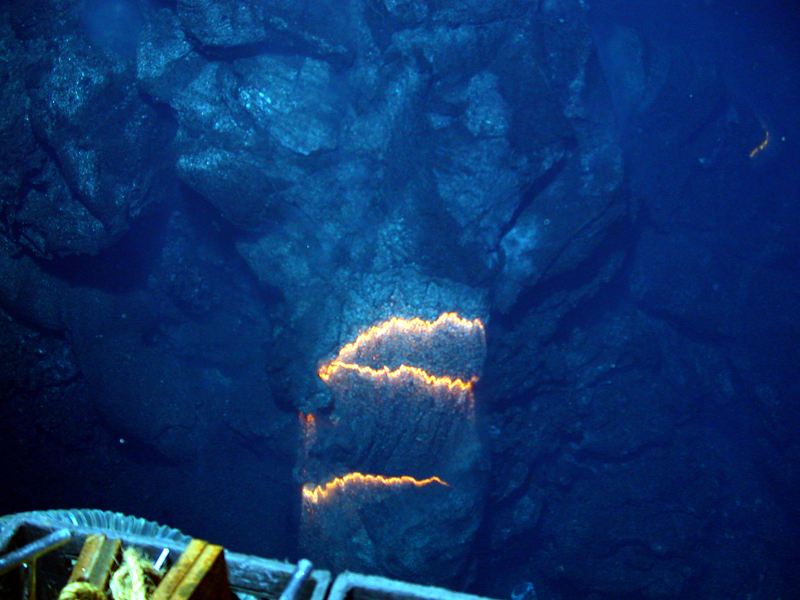 The Lau Basin is home to the Earth's highest subduction rates and fastest-opening backarc basin, which results in one of the Earth’s most densely populated areas of submarine volcanism and hydrothermal activity. Exploratory expeditions using water column sensors and near bottom surveys using a towed camera and a deep-diving autonomous vehicle in 2008-2011 discovered and mapped numerous sites of hydrothermal activity. Information from these cruises provided information used in site selection for the Submarine Ring of Fire 2012 expedition in September 2012, which led to new discoveries. Visit the Lau Basin Theme page. View of Jason working at NW Rota-1 eruptive vent from Medea in the Mariana Arc. Erupting pillow lava at West Mata in the Lau Basin. Map view of the Pacific Ring of Fire.